Enhance commercial lighting with the stylish 12" Barn Light Shade on a straight gooseneck arm. Clean and understated, this all-aluminum gooseneck fixture makes a lovely statement as sign and awning lighting. And rust resistant powder coated paint makes it a durable outdoor light for lasting commercial use. Choose from 25 attractive colors online to match design plans. Order commercial gooseneck lights online with standard incandescent lamping, or call for upgraded options including: compact fluorescent (CF), energy efficient LED, and high-intensity discharge (HID) options metal halide (MH) and high pressure sodium (HPS). Please note HPS and MH gooseneck lights may require different ballasting. Call for details and price quotes. 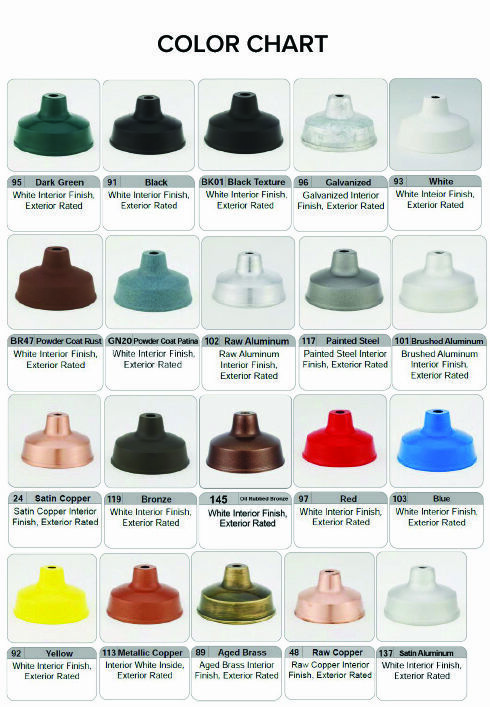 Standard incandescent gooseneck lighting comes with a 4 5/8"D round mounting plate that installs to a 4" flush mounted round or octagonal junction box. Incandescent ceramic sockets are wired for 120V service. Add on wire guard and decorative globe accessories for a distinctive Barn Light look. All outdoor commercial lighting is UL Listed (US and Canada) for exterior use.